The announcement comes from the International Agency for Research on Cancer (IARC). Like the World Health Organization, the American Cancer Society relies on IARC for evaluation of cancer risks. "After reviewing all the evidence available, the IARC working group classified radiofrequency electromagnetic fields as possibly carcinogenic to humans," panel chairman Jonathan Samet, MD, chair of preventive medicine at the USC Keck School of Medicine, said at a news teleconference. "We reached this conclusion based on a review of human evidence showing increased risk of glioma, a malignant type of brain cancer, in association with wireless phone use." In finding cell phones to be "possibly carcinogenic," the IARC means that heavy cell phone use might -- or might not -- cause a specific form of brain cancer called glioma. The finding means that research is urgently needed to find out whether cell phones actually cause cancer, and how they might do it. The IARC estimates that some 5 billion people worldwide have mobile phones. 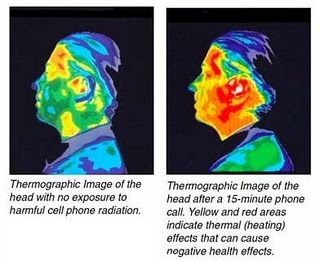 Lifetime exposure to the magnetic fields created by the phones -- particularly when they are held tightly against the head -- rapidly is increasing. Children are at particular risk, not only because their skulls are thinner but also because their lifetime exposure to cell phones likely will be greater than the exposure of current adults.